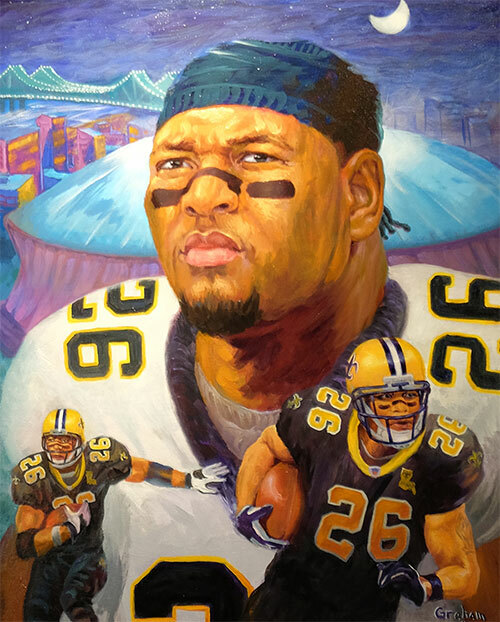 Background: It is hard to put into words the relationship between Dulymus Jenod "Deuce" McAllister and New Orleans, Deuce and Saints fans. The love affair began in 2001, when he was drafted in the first round by the Saints out of Ole Miss. That, despite the fact that the Saints already had Ricky Williams left people guessing about what role McAllister would play and if he was an unnecessary pick. Deuce would erase those doubts quickly, playing in all 16 games while starting four times as a rookie. By his second season, Williams was gone and McAllister was superb. He rushed for 1,388 yards and 13 touchdowns, leading the NFC in rushing, and caught 47 passes for 352 yards and three scores, ranking sixth in the NFL in rushing yards and earned Pro Bowl honors. In 2003, he was even better, starting all 16 games for the only time in his career. He rushed for 1,641 yards, fourth in the league, and scored eight touchdowns and caught a career-high 69 passes for 516 yards as he made another Pro Bowl. The 1,641 yards were the second most in a single season in team history. McAllister rushed for over 1,000 yards in 2004 despite missing two games and eclipsed 1,000 yards rushing in 2006, a knee after suffering a season ending knee injury. McAllister was part of the team that reached the NFC Championship game in 2006. He was so revered by the organization that they re-signed him in 2009 for the playoffs and while he was never activated, he was allowed to lead the team onto the field in the playoffs and was rewarded with a Super Bowl ring for the team's one and only Super Bowl championship. McAllister is the leading rusher in franchise history with 1,429 carries for 6,096 yards. His 49 rushing touchdowns are the most in franchise history and he is second all-time in touchdowns in franchise history with 55. He led the team in rushing in four different seasons. He holds the team record with 27 games of 100 or more rushing yards. The love affair between Deuce and New Orleans continues as McAllister was named to replace the beloved Hokie Gajan as the color analyst on the New Orleans Saints Radio Network prior to the 2016 season. Greatest Moment: On Saturday, Jan. 13, 2007, the Saints hosted the Philadelphia Eagles in the NFC Division round of the playoffs. After trailing 13-7, Brian Westbrook scored consecutive touchdowns for Philadelphia to give the Eagles a 21-13 lead with 13:25 to play in the third quarter. Enter Deuce McAllister. Deuce took over, scoring consecutive third quarter touchdowns of five and 11 yards, giving the Saints a 27-21 lead which they would not relinquish in a 27-24 victory, sending New Orleans to its first ever NFC Championship game. McAllister rushed 21 times for 143 yards and a touchdown and caught four passes for 20 yards and a score in a dominant performance. The five-yard touchdown run personified McAllister, who dragged several Eagles into the end zone after being contacted at the three-yard line. 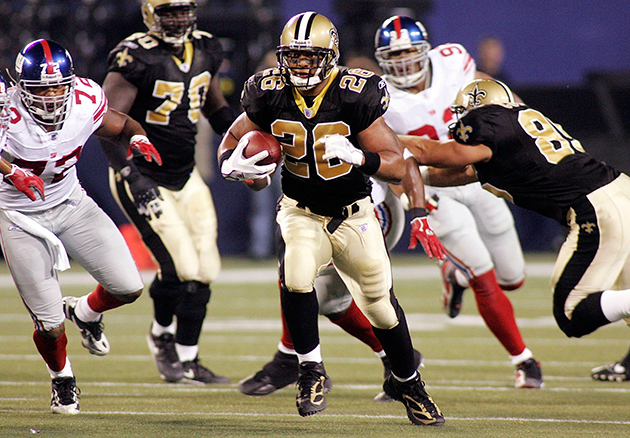 Honors: McAllister was inducted into the Saints Hall of Fame in 2012. He was named to the Pro Bowl in 2002 and 2003. He was inducted into the Louisiana Sports Hall of Fame in 2012 and the Greater New Orleans Sports Hall of Fame in 2015.